Click for the better image! 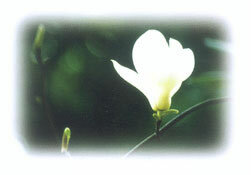 In 1986, the Standing Committee of the Shanghai Municipal People's Congress passed a resolution to adopt the white magnolia as the city flower. White magnolia is among the few spring heralding flowers in the Shanghai area. It is in full blossom in the early spring and before the Clear and Bright Festival, which usually falls on April 5 every year. The flower has large, white petals and its eye always looks towards the sky. 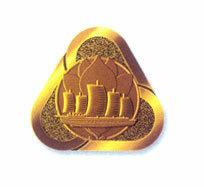 Therefore, the flower is hired to personify the pioneering and enterprising spirit of the city. Design of the city emblem of Shanghai was approved by the Standing Committee of the Shanghai Municipal People's Congress in 1990. The triangle emblem consists of graphics of a white magnolia flower, a large junk and a propeller. The propeller symbolizes the continuous advancement of the city; the large junk, one of the oldest vessels plying the Shanghai harbor, represents the long history of the port; and the large junk is set against a background of a white magnolia flower blossoming in theearly spring, forecasting a bright future of the city. During the Song Dynasty (AD 960-1279) Shanghai was upgraded in status from a village (cun) to a market town (zhen) in 1074, and in 1172 a second sea wall was built to stabilize the ocean coastline, supplementing an earlier dike. 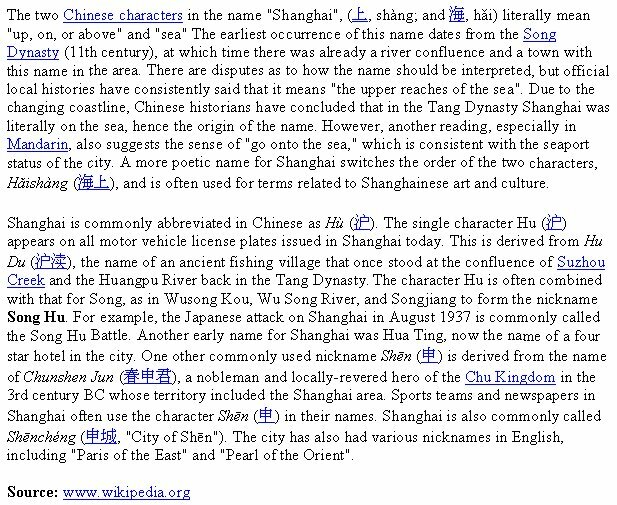 From the Yuan Dynasty in 1292 until Shanghai officially became a city for the first time in 1297, the area was designated merely as a county (xian) administered by the Songjiang (??) Prefecture (Songjiang Fu). Two important events helped promote Shanghai's development in the Ming Dynasty. A city wall was built for the first time during in 1554, in order to protect the town from raids by Wokou (Japanese pirates). It measured 10 meters high and 5 kilometers in circumference. During the Wanli reign (1573-1620), Shanghai received an important psychological boost from the erection of a City God Temple (Cheng Huang Miao) in 1602. This honor was usually reserved for places with the status of a city, such as a prefectural capital (fu), and was not normally given to a mere county town (zhen) like Shanghai. The honor was probably a reflection of the town's economic importance, as opposed to its low political status. During the Qing Dynasty, Shanghai became the most important sea port in the whole Yangtze Delta region. This was a result of two important central government policy changes. First of all, Emperor Kangxi (1662-1723) in 1684 reversed the previous Ming Dynasty prohibition on ocean going vessels, a ban that had been in force since 1525. Secondly, Emperor Yongzheng in 1732 moved the customs office (hai guan) for Jiangsu province from the prefectural capital of Songjiang city to Shanghai, and gave Shanghai exclusive control over customs collections for the foreign trade of all Jiangsu province. As a result of these two critical decisions, Professor Linda Cooke Johnson has concluded that by 1735 Shanghai had become the major trade port for all of the lower Yangzi River region, despite still being at the lowest administrative level in the political hierarchy. The importance of Shanghai grew radically in the 19th century, as the city's strategic position at the mouth of the Yangtze River made it an ideal location for trade with the West. During the First Opium War in the early 19th century, British forces temporarily held Shanghai. The war ended with the 1842 Treaty of Nanjing, which saw the treaty ports, Shanghai included, opened for international trade. The Treaty of the Bogue signed in 1843, and the Sino-American Treaty of Wangsia signed in 1844 together saw foreign nations achieve extraterritoriality on Chinese soil, the start of the foreign concessions. 1854 saw the first meeting of the Shanghai Municipal Council, created in order to manage the foreign settlements. In 1863, the British settlement, located to the south of Suzhou creek (Huangpu district), and the American settlement, to the north of Suzhou creek (Hongkou district), joined in order to form the International Settlement. The French opted out of the Shanghai Municipal Council, and maintained its own French Concession, located to the south of the International Settlement, which still exists today as a popular attraction. Citizens of many countries and all continents came to Shanghai to live and work during the ensuing decades; those who stayed for long periods - some for generations - called themselves "Shanghailanders". In the 1920s and 1930s, almost 20,000 so-called White Russians and Russian Jews fled the newly-established Soviet Union and took up residence in Shanghai. These Shanghai Russians constituted the second-largest foreign community. The Sino-Japanese War concluded with the Treaty of Shimonoseki, which saw Japan emerge as an additional foreign power in Shanghai. Japan built the first factories in Shanghai, which were soon copied by other foreign powers to effect the emergence of Shanghai industry. Shanghai was then the most important financial center in the Far East. Under the Republic of China (1911-1949), Shanghai's political status was finally raised to that of a municipality on July 14, 1927. Although the territory of the foreign concessions was excluded from their control, this new Chinese municipality still covered an area of 828.8 square kilometers, including the modern-day districts of Baoshan, Yangpu, Zhabei, Nanshi, and Pudong. Headed by a Chinese mayor and municipal council, the new city governments first task was to create a new city center in Jiangwan town of Yangpu district, outside the boundaries of the foreign concessions. This new city center was planned to include a public museum, library, sports stadium, and city hall. On 27 May 1949, the Communist Party of China controlled the People's Liberation Army and took control of Shanghai, which was one of only three former Republic of China (ROC) municipalities not merged into neighbouring provinces over the next decade (the others being Beijing and Tianjin). Shanghai underwent a series of changes in the boundaries of its subdivisions, especially in the next decade. After 1949, most foreign firms moved their offices from Shanghai to Hong Kong, as part of an exodus of foreign investment due to the Communist victory. During the 1950s and 1960s, Shanghai became an industrial center and center for revolutionary leftism. Yet, even during the most tumultuous times of the Cultural Revolution, Shanghai was able to maintain high economic productivity and relative social stability. In most of the history of the People's Republic of China (PRC), Shanghai has been the largest contributor of tax revenue to the central government compared with other Chinese provinces and municipalities. This came at the cost of severely crippling Shanghai's infrastructure and capital development. Its importance to China's fiscal well-being also denied it economic liberalizations that were started in the far southern provinces such as Guangdong during the mid-1980s. At that time, Guangdong province paid nearly no taxes to the central government, and thus was perceived as fiscally expendable for experimental economic reforms. 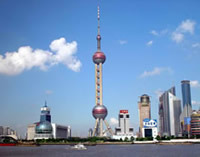 Shanghai was finally permitted to initiate economic reforms in 1991, starting the huge development still seen today and the birth of Lujiazui in Pudong. Shanghai has a humid subtropical climate (Koppen climate classification Cfa) and experiences four distinct seasons. In winter, cold northerly winds from Siberia can cause nighttime temperatures to drop below freezing, and although not usually associated with snow, the city can receive one or two days of snowfall per year. In contrast, and in spite of being the peak tourist season, summer in Shanghai is very warm and humid, with occasional downpours or freak thunderstorms. The city is also susceptible to typhoons, none of which in recent years has caused considerable damage. The most pleasant seasons are Spring, although changeable, and Autumn, which is generally sunny and dry. Shanghai experiences on average 1,778 hours of sunshine per year, with the hottest temperature ever recorded at 40 °C (104 °F), and the lowest at -12 °C (10 °F). 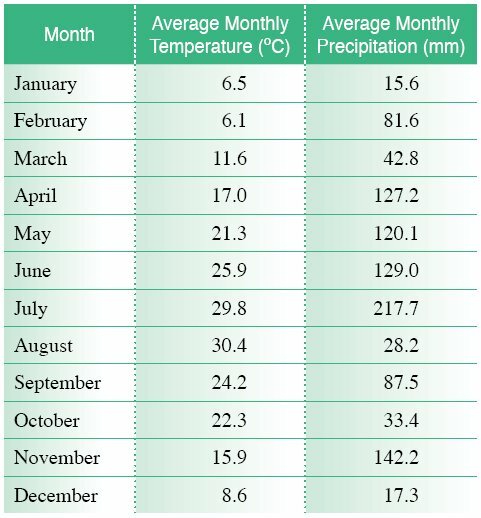 The average number of rainy days is 112 per year, with the wettest month being June. The average frost-free period is 276 days. The latest news, opinions and personal experiences about the Expo!